The Suzuki Kizashi, set to arrive in December, will be the only mid-sized car offering just a four-cylinder engine. Wheelbase 106.3 in. 107.4 in. Length 183.1 in. 188.9 in. Width 71.7 in. 72.1 in. Height 58.3 in. 58.0 in. Curb weight 3,300 lbs. 3,292 lbs. 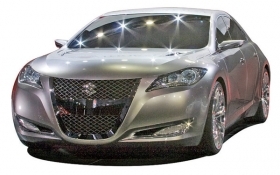 LOS ANGELES -- Suzuki believes its new Kizashi can take on mid-sized sedan segment leaders. But instead of feeling like a spacious Toyota Camry or Honda Accord inside, the Kizashi seems more like a compact German sedan. Of course, that is not entirely a bad thing. Those German cars have lots of character. The basics: While the Kizashi's dimensions are close to those of the Hyundai Sonata and Volkswagen Passat, the car's interior feels more like a tight-fitting VW Jetta. The car seems undersized compared with most other mid-sized Asian-brand cars. There will be no V-6 engine available at launch, making it the only mid-sized car offering just a four-banger. But a snarly V-6 test mule was present at the press launch, which might mean a rolling change. Also, Suzuki is working on bringing out a hybrid gasoline-electric model that uses General Motors Co.'s technology in about 2011. Suzuki calls the Kizashi a sport sedan, and its strut front and multilink rear suspensions have indeed been tuned for a more active ride. The brake supplier is Akebono, which also provides stopping power for Japan's bullet trains. Notable features: All-wheel drive is available on all trim levels, at a premium of $1,250. A button on the instrument panel enables the driver to toggle between front drive and awd. The continuously variable transmission has six preset "gears," or simulated shift points, for drivers desiring more control. The twin muffler pipes are integrated into the rear bumper, a high-class design cue. Standard features include keyless ignition, eight airbags, 16-inch wheels, four-wheel disc brakes, foot-well lighting, nine-speaker audio system, steering wheel audio controls, dual-zone climate control with rear-seat vents, and split rear seats with pass-through. What Suzuki says: "There is certainly a role for soulless transportation in this segment," says Gene Brown, American Suzuki's head of marketing. "But what's needed is a world-class sports sedan that the average Joe can afford." Compromises and shortcomings: It is smaller than the typical mid-sized sedan, so the Kizashi sacrifices rear-seat legroom. Headroom is passable. Because the Kizashi was developed with crash safety in mind, the A-pillars are gigantic -- so thick that when combined with the side mirror an A-pillar can effectively hide a pedestrian or motorcycle in the blind spot. The CVT saps 5 hp vs.the six-speed manual. The interior fit and finish, though fine for a car of the Kizashi's price, is no match for the German sedans to which Suzuki compares it. The market: Suzuki estimates the mid-sized sedan segment at 1.7 million annual sales. Grabbing a 1 percent share means 17,000 units, a level that would be profitable for the U.S. market, a Suzuki source says. The car arrives in December, but the marketing launch won't be until the spring. Suzuki has not announced exact pricing, but the base model is expected to come in at less than $20,000, including destination. Well-equipped models should be priced in the $21,500-$26,500 range. The skinny: Remember the original Nissan Altima and Mazda6? They were tweener cars priced against the segment leaders. They didn't do so well. Only when the Altima and Mazda6 matched the segment leaders in size and powertrains did the cars meet sales expectations.